Service Costs > How Much Does a Home Depot Truck Rental Cost? How Much Does a Home Depot Truck Rental Cost? Whether you want to deliver a larger-than-average item from Home Depot or elsewhere straight to your home on your own, almost all Home Depot locations allow you to rent one of their flatbed trucks or cargo vans either by the hour, day, week or even month. As of 2018, the official Home Depot website claims the first 75 minutes will cost $19 and for every additional 15 minutes after the first 75 minutes will incur a $5 per 15-minute fee. This is the rental fee for the pickup truck or cargo van only. All reservations will require a $50 deposit, but as with any deposit, it will be refunded upon dropping off the truck. First, make sure you qualify for the truck rental. Home Depot requires that all applicants must be 21 years old and have either an U.S. or Canadian driver’s license. If it’s a Load ‘N Go rental, then automobile insurance is required as well. Next, check the availability of either the rental flatbed truck or cargo van by visiting the official Home Depot website. On the confirmation page, once you input your zip code, you will be presented with a list of nearby stores and a status as the availability of the rental in question. If available, you will then be able to reserve by calling the local store. Once confirmed by the store, you will then arrive at the Home Depot of choice, either at the Special Services desk or Tool Rental Center to secure your truck. The Load ‘N Go flatbed truck has a specialty aluminum bed capable of loading up to 3,000 pounds, while the cargo van has the same weight capacity but the bed will be enclosed. This truck/program is intended for those who want to rent it for a few hours at a time, but it can, upon request, be rented by the day, week or even month. The vehicle make, model and year may vary slightly by store, but for the most part, they will be similar in terms of features. Product features for the flatbed truck include automatic transmission, air conditioner, a seating capacity of three, four-wheel anti-lock braking, dual seat-mounted side airbag, V8 engine, stereo and a backup alarm, while the cargo van offers dual bucket seats and cargo tie downs, in addition to the flatbed truck features. 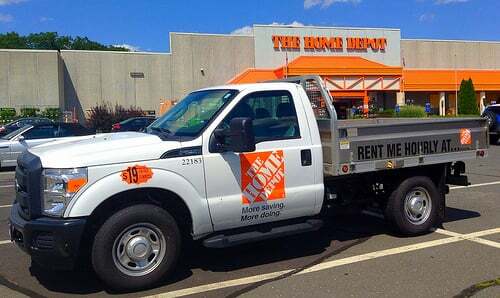 In order to rent a Home Depot rental truck, the applicant must be at least 21 years old and have a either a valid U.S. or Canadian drivers license. Proof of insurance is only required for Load ‘N Go rentals. To avoid a fuel surcharge, the truck must be returned refueled. No one-way rentals are allowed and all trucks must be returned to the same stores they were rented from initially. You do not need to make a purchase from Home Depot in order to reserve the truck for the day, but some have reported at the manager’s discretion as some were unable to rent without making a large purchase. It’s always best to call the store in question to know the official rules.